The KnowledgeCloud was presented by the first author during a lecture at Rutgers University, as part of The Tilburg Story of Knowledge Sharing for Social Innovation. In a society suffering from civic fragmentation and information overload, no longer access to information is the real problem, but how to effectively use that information to create knowledge relevant to individual and communal needs (Lankes, Silverstein and Nicholson, 2007). Civic engagement entails strong links between online and offline interactions (Smith, 2013). However, finding the right knowledge and engaging contacts for effective local/regional knowledge sharing, participation and collaboration is a challenge. Public libraries can help society address this challenge, as, from repositories of books, they are rapidly becoming "public sensemakers" and "social innovation catalysts" (De Moor and Van den Assem, 2013). They are uniquely positioned for this role as they are trusted and rooted institutions with a mission to serve the common good by promoting education and media literacy for all. Still, to refocus their existing social capital, skills, and resources, libraries need to go through a significant transition. One state-of-the-art innovation, for example, are Library-Hack-Maker Spaces where public libraries become "community libraries", capable of attracting, capturing, curating, and sharing local knowledge and know-how for mutual benefit, using typical hacker and maker spaces skills. Such spaces focus on catalyzing the production process of combining creative contributions of local users with a community lending and publishing platform (Naylor 2014). Another angle is the KnowledgeCloud concept being developed by the Dutch Tilburg public library. Its focus is to strengthen the fabric of knowledge interactions between stakeholders that make up regional society, providing context for and developing linkages between its constituting communities. Fig.1: The KnowledgeCloud Architecture. Click here to see the full figure. Users can create individual user profiles. A network of thematic knowledge groups. Any user can subscribe to any knowledge group or start a new one. In knowledge groups, discussions take place, people are invited for events, files are shared, and related communities and networks can present themselves. Discussions and (invitations for and shared results of) regional events like workshops, debates, and presentations. Discussions and events are typical "boundary objects", such objects performing a brokering role between the perspectives of intersecting communities (Fisher and Shipman, 2011). By effectively using tags and notifications the platform catalyzes connections and interactions between themes and participants. For example, the home page of the platform shows "what's hot" in the region through a tag cloud that is an aggregation of all user, knowledge group, event, and discussion tags. This could be a powerful service for, say, a civil servant who is looking for the best possible ideas & consortium for receiving a municipal subsidy. Tag subscriptions - on site and by e-mail - are used to notify platform users of potentially relevant online activities. Community librarians: librarians supporting regional knowledge processes. Their tasks include user and knowledge group support, discussion facilitation, resource tagging, reorganizing tags, notifying users of potentially relevant content, linking discussions across knowledge groups, etc. KnowledgeWorkshops: library-facilitated public physical meet-ups around societally relevant themes. Think Tank Services: public or invitation-only sessions focusing on addressing specific knowledge questions. A regional stakeholder like a government body or health care organization can request a Think Tank session to help develop innovative concepts and solutions. Results may remain partially confidential, but there should be at least some public feedback of the results on the online platform. Relevant Internet resources: for example, semantically enriched Internet queries (using KnowledgeCloud tags and librarian expertise) to feed targeted knowledge group discussions. Relevant library services: existing library services tailored to KnowledgeCloud needs. An example would be selected books or multimedia items being used to support a specific KnowledgeWorkshop or knowledge group. A major transformation of the national Dutch (health)care system is underway. A Tilburg elderly care home director posed a question of how to ensure minimal care levels after the transition. The library organized a Think Tank Service session to address this issue, inviting a selected group of external professionals to brainstorm with care home staff and residents. Some promising ideas were elicited and are further being shared and developed in the online Elderly Care Innovation knowledge group. A related project in the Tilburg region was mentioned there. The online discussion continues on how to align and expand the two projects. A follow-up physical KnowledgeWorkspace session will be organized where the projects will be presented, using the online discussion results to set the agenda. Development of the online platform, services, and applications started in September 2013, co-sponsored by the Tilburg public library, the provincial library association BNB and the Province of Noord-Brabant. A beta-version is currently being tested with dozens of invited users, from real cases like on elderly care innovation. The KnowledgeCloud was publicly launched in the Tilburg region in fall 2014. Collaborative partnerships are being developed with organizations like the Midpoint Center for Social Innovation (MCSI), a regional social innovation hub. MCSI considers the KnowledgeCloud to be a key enabling instrument for social innovation, since that is all about developing relationship networks and collaboration processes around new ideas that meet unmet needs (Murray, 2010). There is also significant interest at both the provincial and national public library levels. Other provincial libraries will start testing their own implementation soon. A large funding proposal is being prepared by a national consortium of innovative public libraries to further scale up the concept and implement it on a national level. Ultimately, a national federation of KnowledgeClouds should emerge. The KnowledgeCloud has many different meanings. It helps to innovate the societal role of public libraries through services like community librarians, Knowledge Workshops and by providing a knowledge context for related library innovations like Library-Hack-Maker Spaces (Naylor, 2014). It could also help evolve underlying technical library infrastructure, such as content catalogues and Semantic Web services. One such global library infrastructure, for example, is WorldCat, which is a kind of a “collective collection” of the world’s libraries (OCLC 2014). What if the power of the taxonomies of such aggregated collections would be combined with the tag clouds relevant to regional communities emerging through a worldwide federation of KnowledgeClouds? This could help to turn the Semantic Web into a truly “Pragmatic Web”, making semantic technologies more relevant to actual use in communities (Schoop et al., 2006). 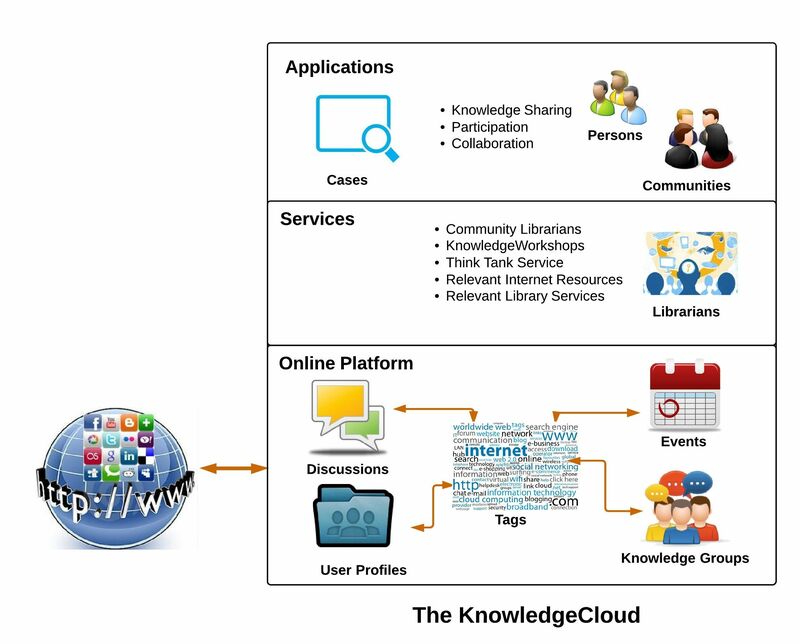 Through such societal and technical public library innovations, each KnowledgeCloud could grow to become a cornerstone of a trusted, sustainable regional knowledge commons, owned and driven by society instead of corporate interests (Bauwens and Kostakis, 2014). Such a commons should help increase the level of "civic intelligence”: the ability of humankind to use information and communication in order to engage in collective problem solving (Schuler, 2001). By fostering more long-term and intensive knowledge interactions between regional stakeholders, the KnowledgeCloud helps to more effectively address the “wicked” collective problems that individuals, organizations, and communities on their own cannot tackle. Bauwens, M., and V. Kostakis. 2014. “From the Communism of Capital to Capital for the Commons: Towards an Open Co-Operativism.” tripleC: Communication, Capitalism & Critique. Open Access Journal for a Global Sustainable Information Society 12 (1): 356–61. De Moor, A., and R. van den Assem. 2013. “Public Libraries as Social Innovation Catalysts.” In Proc. of the 10th Prato CIRN Conference “Nexus, Confluence, and Difference: Community Archives Meets Community Informatics”, Prato, Italy, October 28-30. Fischer, G., and F. Shipman. 2011. “Collaborative Design Rationale and Social Creativity in Cultures of Participation.” Human Technology 7 (2): 164–87. Lankes, D., Silverstein, J. and Nicholson, S. 2007. “Participatory Networks: The Library as Conversation.” Information Technology & Libraries, 26(4):17-33. Murray, R., J. Caulier-Grice, and G. Mulgan. 2010. “The Open Book of Social Innovation. Social Innovator Series”. London: NESTA & Young Foundation. Naylor, A. 2014. “On the Origin’s of St. Botolph’s Library-Hack-Maker Space: Envisioning the Library of the Future from the Ground Up.” UK: Common Futures. Schoop, M., A. de Moor, and J. Dietz. 2006. “The Pragmatic Web: A Manifesto.” Communications of the ACM 49 (5): 75–76. Schuler, D. 2001. “Cultivating Society’s Civic Intelligence: Patterns for a New ‘World Brain’.” Information, Communication & Society 4 (2): 157–81. Smith, A. 2013. “Civic Engagement in the Digital Age.” Washington, D.C.: Pew Research Center. Discussion of "The Tilburg Public Library Knowledgecloud"
Version 34 id 325507 of this page, updated 19 March 2015 by Rebecca Michelson. Created by Rebecca Michelson.